Most people consider themselves safe drivers, but even good drivers can make mistakes if they take their attention off the road—even for a second. Unfortunately, with the ubiquitousness of technologies such as cell phones, navigation systems, and in-vehicle entertainment, it's easier than ever for drivers to become distracted behind the wheel. Learning about common distracted driving behaviors—and how to avoid them—can help drivers keep themselves, their families, and other motorists safe on the road. Visual distractions that cause the driver to take his eyes off the road. Manual distractions that cause the driver to take his hands off the wheel. 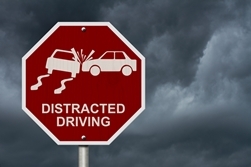 Cognitive distractions that take the driver’s focus off the task at hand. Most people who engage in distracted driving behaviors don't do so with the intention of being dangerous. Rather, they fall prey to the myth of “multi-tasking.” Contrary to popular belief, science shows that the brain is incapable of multi-tasking and, when people think they're multi-tasking, their brain is actually rapidly switching focus between various tasks. While that might be okay in an office setting, it can create dangerous—and even deadly—situations on the road. 3,179 people were killed and 431,000 were injured in distracted driving accidents in 2014, according to the National Highway Traffic Safety Administration (NHTSA). Drivers spend more than 50 percent of their time behind the wheel focusing on things other than the task of piloting the vehicle, according to the AAA Foundation Traffic Safety Culture Index. At any given moment, approximately 660,000 drivers are using cell phones or other electronic devices while they drive, according to the NHTSA's annual National Occupant Protection Use Survey (NOPUS). Distracted driving plays a role in 10 percent of fatal crashes involving drivers ages 15 to 19, according to the NHTSA. Drivers in their 20s are the most likely demographic to drive while distracted, accounting for 27 percent of fatal distracted driving-related crashes and 38 percent of fatal cell phone-related distracted driving accidents, according to the NHTSA. The percentage of drivers who admit to text messaging or using handheld devices while driving increased from 1.7 percent to 2.2 percent between 2013 and 2014, according to the NHTSA. Drivers between the ages of 16 and 24 are more likely to use electronic devices while driving than their older counterparts, according to the NHTSA. Engaging in distracted driving behaviors creates latency that lasts for an average of 27 seconds, meaning that, even after drivers discontinue the distraction, they're still not entirely focused on the road, according to the AAA Foundation. Although texting and the use of cell phones for other purposes while driving are distractions that carry great risk, they're far from the only distractions drivers may experience. Other common on-the-road distractions include having an involved conversation with passengers, disciplining children, eating or drinking, adjusting the radio, grooming oneself, and using paper maps or operating an in-vehicle navigation system. Abstaining from talking—or texting—on cell phones while driving. Avoiding adjusting the radio or fiddling with the navigation system when behind the wheel; those tasks are best left to passengers. Not eating or drinking while driving. Completing grooming behaviors—such as fixing hair, applying makeup, or shaving—before getting in the vehicle. Pulling to the side of the road if a distraction can't be avoided. If you were injured in an accident caused by a distracted driver, the experienced attorneys with the Morris James Personal Injury Group can help you explore your legal options and determine if you're eligible to pursue compensation for your injuries. Contact us today to schedule an appointment for a free initial case consultation.